Rule Number 1 – the bag needs to be packed the night before! We weren’t supposed to be climbing anymore, but the draw to the mountains was stronger than us. Except for the mountains at the moment are still out of bounds… The avalanche danger is still High/High/Considerable. 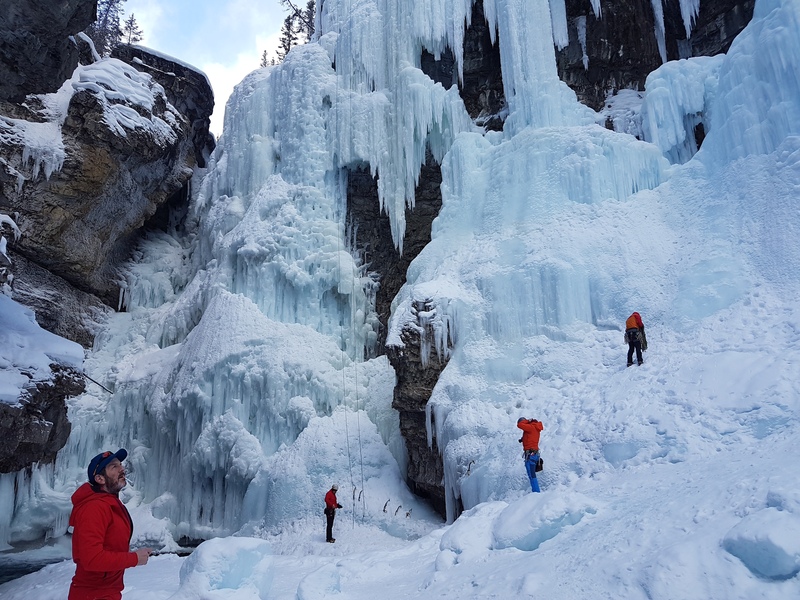 I’ve looked around the guidebooks for some avy safe cragging area – and we agreed on Johnston’s Canyon. It’s pretty popular spot just 40min drive from Canmore (first exist, past Banff, going from Canmore. 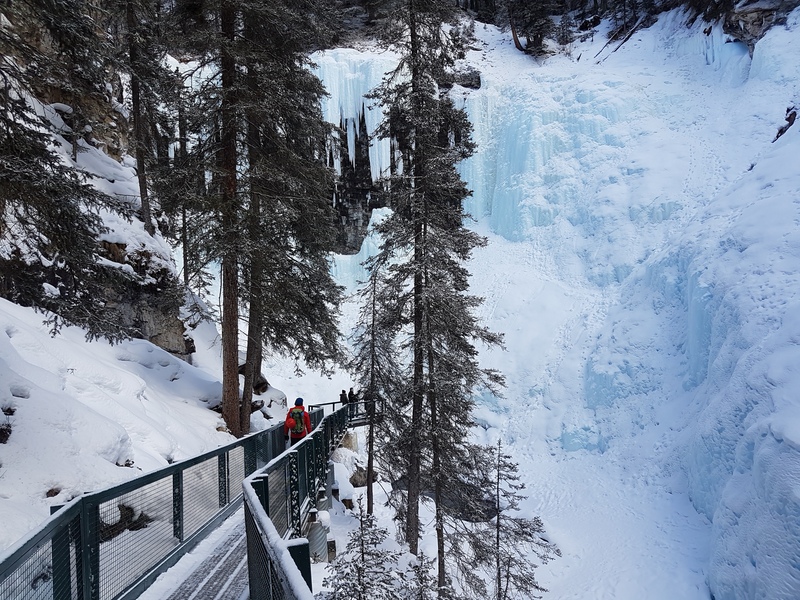 It’s on the old Lake Louise Road 1a – can’t miss it. ) and to quote the guide book: “it is as close to an area of “sporting ice” as the Canadian Rockies offer”. Good enough for us! Just setup that TR and do goodbye laps on steep ice. Since Lar’s knee is still healing (it’s much better now, but he didn’t want to risk more serious injury), he stayed behind and PG and I left before 9am. The walking to the crag is exceptionally pretty. 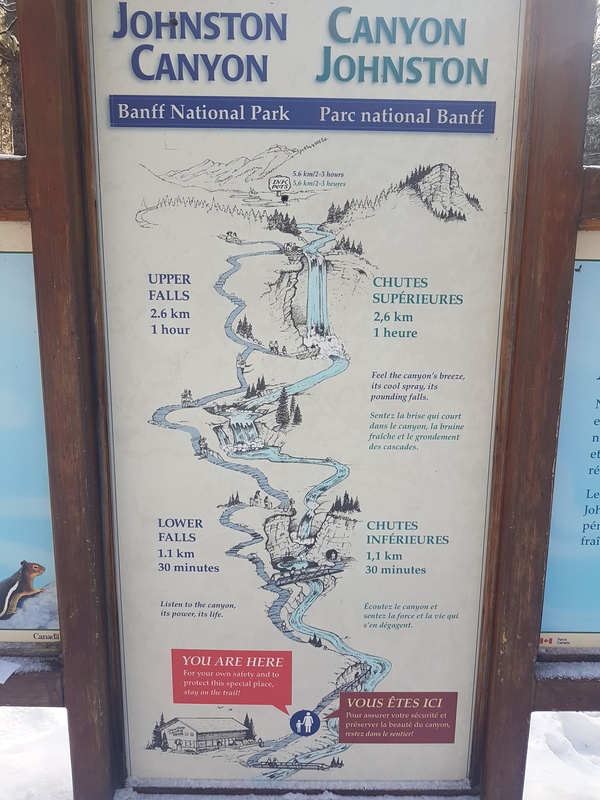 It’s a 3km trail that goes via the Canyon itself, ending at the Upper Falls. It is VERY popular among tourists (more about it later) – apparently visited annually by 1mln tourists. When we arrived around 9.30 am there were maybe 3 or 4 other cars and a parking lot that was a big as if it was in front of a supermarket. By the time we were leaving, it was nearly full! End of the path at Upper Falls. This place really draws tourists in. The path ends where the Upper Falls are. We were climbing there for few hours, and during that time the viewing platform was always full. It felt like wild animals in a zoo. There were 4 or 5 other climbing pairs, and at least 25 onlookers at any given time. They don’t bother me to much, as long as they stay in the designated areas. Tourists are pouring in through the fences. 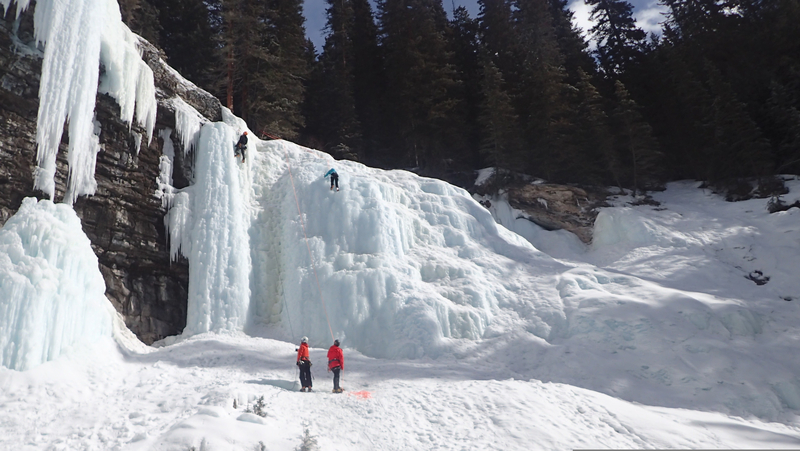 Going back to climbing and the crag itself – there are 2 main walls/sections – on the climbers left – really tall (need 70 or 80m rope if you want to abseil in 1 go) icicles – some of them connected, creating big pillars, some free hanging, some already broken off. Lines there go to WI5 difficulty. Left hand side – Need long ropes. Since we only taken Lar’s 60m Volta rope, we confined ourselves to the right hand side area – that also offered nice climbing lines. I’d say up to WI4 in difficulty (but also plenty of WI3 and 2 options – the more right you went, the easier it got). Right hand side. 60m single rope will suffice. Some random people runnig laps. We setup a TR on the left side pillar and climbed it in every way possible (up and down, many times) – trying to avoid the hooked out middle. The climbing line itself is around 22m, and ends with tree belays. The left pillar is steeper than it looks and it gave a nice workout. It felt like and outdoors sport crag indeed! It was a worthy bonus day. Risk free excursion to swing some axes on a sunny day. Can’t complain! Tomorrow we are flying back to Dublin and while there won’t be more climb descriptions from this particular area, I’ll keep writing for some weeks to come about some other interesting aspects of a 2 weeks ice climbing trip (some gear reviews, some video material I haven’t had time to process yet). 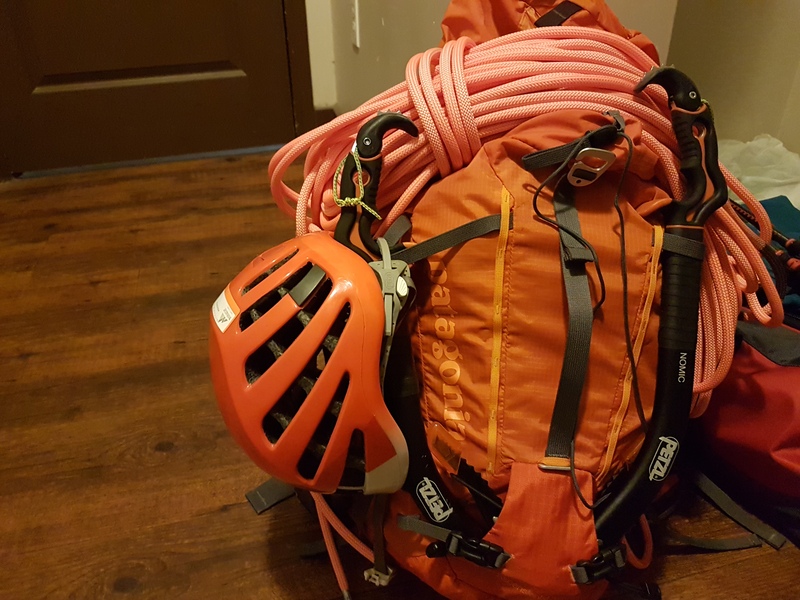 In the mean time the rock climbing season will roll in, so new adventures time! ← Carnage on the slopes.